January is a time of beginnings – new year, new resolutions, new choices. Make 2018 YOUR year to conquer clutter chaos and gain control of your house! I define clutter as anything that takes up space without serving any real purpose in your life. That simple statement helps my clients decide what to keep or let go. Clutter looks and feels different to everyone. It causes stress and a somewhat-to-completely-overwhelming, chaotic and sometimes unhealthy environment. It’s a daily negative reminder, conscious or unconscious, of tasks left undone. Over time, storage areas like closets, basements and garages become stuffed. Therefore, things that should be in storage areas overtake living spaces. There are personal costs like stress, time wasted searching for things and money wasted rebuying things you can’t find or forgot you have. It’s time to reclaim your space. Start with decluttering. Gather trash bags and label bins Elsewhere (for everything that doesn’t belong here), Donate, Recycle, Repair and Unsure (use sparingly). Pick a corner to start. Grab the first item, put it in the trash bag, the correct bin or leave it if it stays. Grab the next item and so on, without skipping around, until the entire room is decluttered. Do not retrieve anything you removed! Take out the trash and recyclables, drop off donations, distribute Elsewhere bin items, repair what needs fixing and make decisions about Unsure bin items. Select the next room and repeat until done. Decluttering is just the first step before organizing takes place. To be organized, among other things you need a strategy as to where everything that remains will be placed, systems that work for you, organizing principles and new habits, all of which work with your situation, personality and preferences, and maintenance techniques. Some people are held hostage by their stuff. 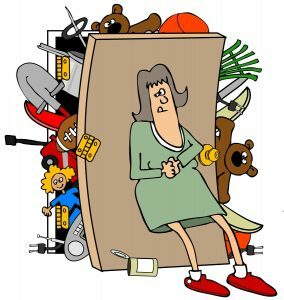 They hold on to things long after they’ve outlived their usefulness due to sentimental reasons, packrat tendencies, monetary value, so-and-so gave it to them or “I might need it someday.” Unused things displace things that are used. As an organizing consultant, I know it’s not about just getting rid of things. It’s about the person, not the stuff. Often there are underlying psychological reasons. I dig deeper to help my clients understand WHY they’re keeping unwanted stuff. I offer safe ways to let go without losing connections to things. Once clutter is conquered, calm replaces chaos and your home reflects how you want to live. Sound amazing? It is! Contact me if you’d like help. previous post: What’s the Secret to Stress-Free Holiday Decorating? next post: How Well Do You Maintain Life Balance?